Power Windows is reporting that the November Guitar Center catalog includes an item called the "Neil Peart Snakes & Arrows Snare Drum." Looks like this will be selling for $899.99, with no payments until 2009. I didn't see anything on the Guitar Center website yet. Check out the bit about the "special batter head." "This stunning 6"x14" snare features an Aztec Red finish with handpainted gold leaf and metallic gray Snakes and Arrows graphics. 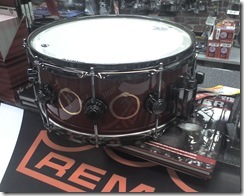 The finish is done by DW master craftsman Louie Garcia, who paints Neil Peart's own drums. DW's unique Black Diamond hardware is made of nickel, but it's as hard and durable as chrome. The all-maple shell utilized DW's proprietary VLT (Vertical Low Timbre) design, with a vertical grain pattern that allows for a lower overall tone without sacrificing resonance and attack. The special batter head features a printed Neil Peart signature. Everything about this drum was designed in accordance with Neil Peart. This is the same snare Neil is currently using on the Snakes and Arrows tour. See it first at Guitar Center."